"This is a hit for football Sundays. For a thicker stuffing, drain ricotta overnight. Serve with ranch and blue cheese dressing for dipping." Preheat oven to 375 degrees F (190 degrees C). Prepare a 13x9-inch baking dish with cooking spray. 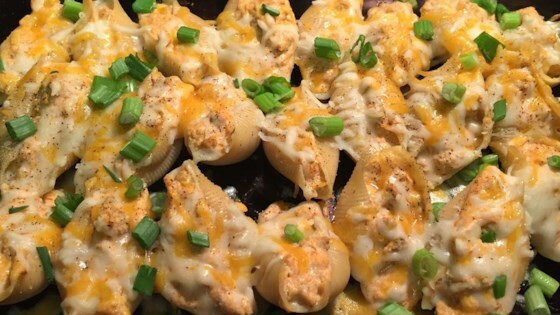 Game day ready Buffalo-flavored chicken stuffed pasta shells. I loved this! I added finely chopped onion and celery to chicken as I cooked it. Not only added flavor and crunch but also increased volume of filling for extra shells. This recipe is a keeper!